Register here for one event or all. Learn how to get more productive quickly and get answers to questions – all within 30 minutes! 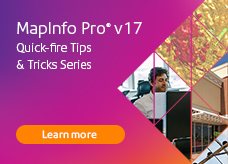 MapInfo Pro v17 is stronger, smarter and simpler than ever. After an extended beta release and substantial user feedback, geospatial professionals like you are now able to experience refreshingly intuitive GIS software, offering more freedom for you to be effective. That said, we all know continual support and insights can make all the difference.